Welcome to Breaking New Grounds. Every coffee shop is different, and no one knows that better than you—the coffee shop owners who build a unique story and brand with every cup. We’re excited to begin a series that profiles coffee shops on our 6 AM blog! Complete with tips, tricks, and interviews, we’ll be delving into the concept behind every shop. While everyone over at CUPS certainly knows their coffee, we can give you no better advice than the words of wisdom of another coffee shop owner—so read away! Our first featured coffee shop is Pourt. 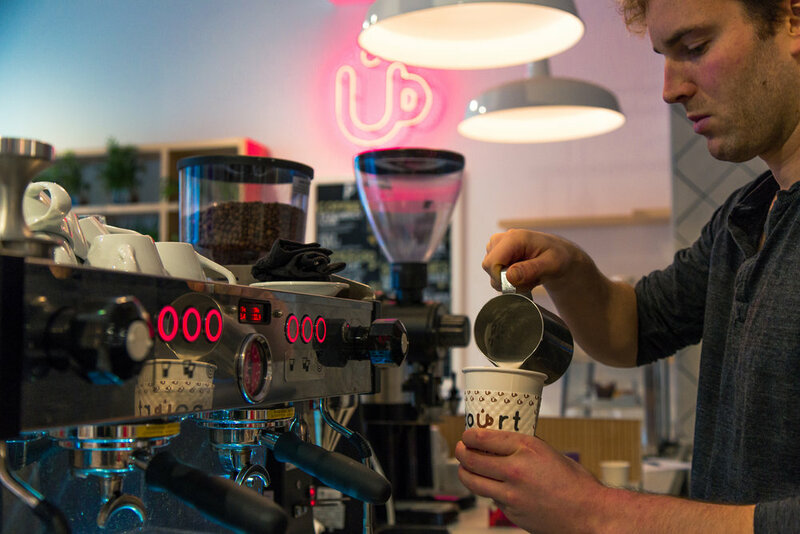 Just like a good cup of coffee with multiple layers of flavor, co-owners Matt and Mike endowed their coffee shop with a name holding multiple layers of meaning that, all together, represent their vision for Pourt. 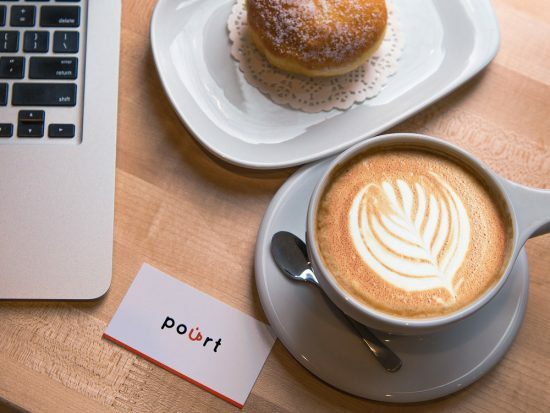 What the word “port” first calls to mind is an outlet you’d plug your laptop into—and the first part of their mission was to create a place where people could plug in and get work done. But a port can also be a shipping port, or a center of trade. In the same way, Matt and Mike think of their coffee shop as a place where people can trade ideas and brainstorm. Lastly, the spelling is also a nod to the coffee beverages they “pour” fresh every day. They see Pourt as not only a specialty coffee shop, but one for movers and shakers—a place where ideas are made and things get done. Both co-owners were freelancers and enjoyed the communal aspect of working in a coffeeshop, but realized that there were definite downsides. WiFi was often spotty, customers could get loud, and it took the price of a pastry or new cup of coffee every couple hours to save a spot without a barista eyeing you down. The alternative, being an office or public coworking space such as WeWork, would always be quiet and well-stocked but lacking in the casual atmosphere, positive vibes, or high-quality caffeine offered by local coffee shops. This market gap is how Pourt came to be: a hybrid of the coworking space and the specialty coffee shop. Filled with light and modern music, the cafe in the front overlooks Cooper Square, while the pay-as-you-go coworking space is located in the back. With a chef-selected menu featuring Intelligentsia coffee, the coffeehouse is conducive to group work and conversation. The back is ideal for individual work—it’s outfitted with individual desks, outlets, task chairs, “unnecessarily fast” fiber-optic Internet and unlimited coffee. Pourt’s hybrid model fills demand for a number of services, making it unlike other coffee shops or coworking spaces. “The challenge is that we can’t just say to a customer, ‘We’re like this place, or our concept is similar to “blank,”’ because our concept is so new,” says co-owner Matt. Pourt has certainly made its impact on the surrounding area, providing a location for a variety of communities. Matt describes its impact as “like a haven in the city where people can feel comfortable, either hanging out or doing work.” Freelancers and professionals are regulars, as well as students from nearby NYU, Cooper Union, and Marymount Manhattan College. “We think we’ve created the nicest cafe to do work in,” Matt says, exemplifying what Pourt’s vision has been ever since the beginning. Want to share your coffee shop’s story? Reach out to the CUPS team at community@cupsworks.com.